Last Friday, the Prop. 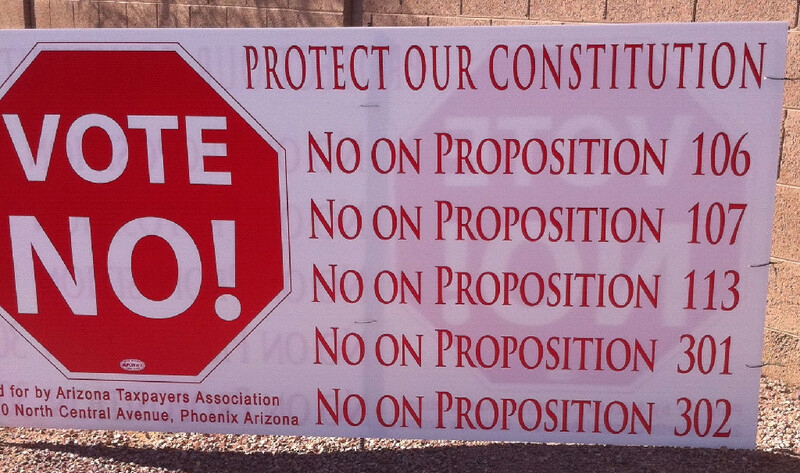 107 campaign and Shane Wikfors, Treasurer of the Arizona Taxpayers' Action Committee, filed a joint complaint against the deceitfully named "Arizona Taxpayers Association," which has been posting signs around town urging voters to vote no on all the propositions. The complaint alleged numerous campaign finance violations, as well as violations of IRS and Corporation Commission regulations. As the Chair of the Proposition 107 campaign and Treasurer of the Arizona Taxpayers Action Committee, we write to urge you to take action against the disguised ballot measure committee the “Arizona Taxpayers Association” for a series of campaign finance violations that may rise to the level of ballot fraud. The organization involved has no intent of representing Arizona taxpayers, but has the explicit intent of deceiving voters and fooling them into voting against propositions they otherwise might support. The evidence of this intent is compelling, and given the fact that early ballots are already being sent out, urgent action by your office is requested and required. As you may know, this group has put up campaign signs all over Arizona urging citizens to vote no on all the ballot propositions. A news item is attached which includes a photo of the signs, which you can find on almost every major street corner in the Phoenix metro area. This group is clearly attempting to defraud the public by pretending to be a conservative organization and using buzzwords such as "save our constitution" and their very name, the “Arizona Taxpayers Association”. In reality, this group is headed by card carrying members of the extreme left. According to Corporation Commission records (attached), longtime Democrat operative and former chair of the Arizona Democrat Party Bob Grossfeld is the President of the organization, and Jim McLaughlin, union boss for the local United Food and Commercial Workers, which helped lead the boycott charge against Arizona over Senate Bill 1070, is listed as a director. In addition, Corporation Commission records reveal that the group is headquartered out of the office of ultra-liberal Democrat lawyer and another former Chair of the Arizona Democrat Party, Sam Coppersmith at 2800 N. Central Ave., Suite 1200, Phoenix. While this campaign is deliberately attempting to hide its ties to the extreme left and cast itself in a false light that in itself is not illegal. However, they are nonetheless guilty of several significant campaign finance violations. 1. “Arizona Taxpayers Association” is a political committee under ARS 16-901(19) and 16-902.01. Although it is registered as an independent expenditure committee, it is clearly really a ballot measure committee. It exists solely to put up these signs around the state opposing several ballot initiatives, nothing else. If it walks like a duck, quacks like a duck…. As such, it is required to register as a political committee, and such registration must include the address, the names, addresses and occupations (and other information) of the Chairman and Treasurer of the committee, the name, address, relationship and type of any sponsoring organization, and any bank accounts. ARS 16-902.01(B)(3). None of this information was provided in its initial filing. http://www.azsos.gov/cfs/FilerDetail.aspx?id=201000784. This group filed as an independent expenditure committee on September 27, 2010, no doubt in order to hide that kind of revealing information from the voters. In addition, ballot measure committees are required to include the official serial number for the ballot initiative, and whether the committee supports or opposes the measure. ARS 16-902.01 (F). This is also missing. 2. ARS 16-902.01(A) requires a political committee to register "before accepting contributions, making expenditures, [or] distributing any campaign literature..." This committee did not file until September 27, 2010, and their signs were seen up as early as September 25, and there are news reports from September 27 about their signs, which were likely put up before September 27. But even if they went up on that day, there is no way possible that this group could have gathered contributions, had signs printed, and put them up all on September 27. Clearly they have also violated this law. 3. This committee has put the wrong address on its signs. The signs say the committee is located at 2600 N. Central Avenue, when in reality its headquarters are at Sam Coppersmith's law firm at another address, according to records with the Arizona Corporation Commission. http://starpas.azcc.gov/scripts/cgiip.exe/WService=wsbroker1/names-detail.p?name-id=12965300&type=CORPORATION The address listed there is 2800 N. Central Ave., Ste. 1200. This is clearly an attempt to hide this organization's ties to the far left, and it amounts to a fraud on the voters. 4. ARS 16-914, which requires notification to the Secretary of State once contributions of $10,000 or more have been received or expenditures of $10,000 or more have been made by a ballot measure committee, has likely also been violated. As yet, no such notifications have been posted on the Secretary of State's website, even though this group must have easily spent well over $10,000 on signs attempting to defraud Arizona voters. 5. The disclaimers “Paid for by No 106, No 107, No 109, No 110, No 111, No 112, No 113, No 203, No 301, & No 302 Committees” were recently added to the signs (although they have not been added to all of the signs, there were some spotted in Flagstaff without the disclaimers), and suddenly reports were filed on October 1 with the Secretary of State’s Office. Since two former Chairmen of the Arizona Democrat Party are behind these committees, they should clearly know better. They attempted to get around the law and hide their identities by not filing as ballot measure committees, but once these signs became public, they filed reports late as ballot measure committees and modified their signs. This was not an innocent correction, but purposely done late into the election when half of the voters have already sent their early ballots back in. The new committees still do not comply with the requirements of ballot measure committees, lacking the name of any sponsoring organization and any bank accounts. In addition to violating campaign finance laws, this organization appears to be violating IRS regulations and Corporation Commission regulations. It is listed as a nonprofit organization with the Corporation Commission, but nonprofit organizations are prohibited by the IRS from engaging in lobbying as their primary activity. The sole function of this sham committee is to engage in advocacy regarding ballot measures. As such, it is in violation of IRS rules and its status with the Corporation Commission as a nonprofit organization. This isn’t the first time this dishonest group has tried to deceive Arizona voters. They put up similar signs opposing city ballot measures all over Tucson two years ago. Based on the evidence presented above, please take immediate action to force the “Arizona Taxpayers Association” to comply with the law and impose appropriate penalties. The public has a right to know who is really behind this shady, left-wing organization. There's not much we can do about their deliberate attempt to mislead Arizonans, but they must be held accountable for their violations of the law. Please let us know if you need documentation of the above.